It's called the Allonautilus, and it could be the rarest creature on the planet. 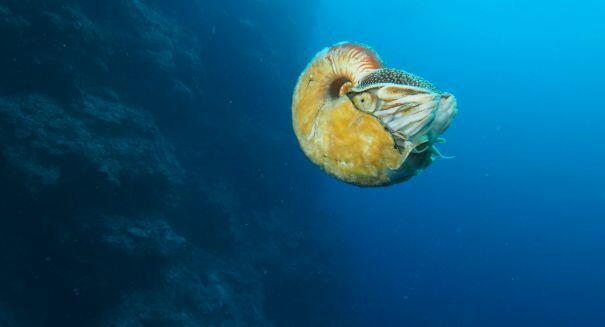 An amazing discovery has been made off the coast of Papau New Guinea: a nautilus that hasn’t been seen in three decades. Biologist Peter Ward of the University of Washington found the Allonautilus scrobiculatus during a research expedition of the coast of Papau New Guinea back in July. This animal, often called a “living fossil” that is related to the octopus, squid, and cuttlefish, has not been seen in 30 years, according to a CNET report. Allonautilus as a species is reportedly about 500 million years old. Ward and his team had suspended a baited stick with fish and chicken meat between depths of 500 and 1,300 feet, and filmed the results. Many creatures showed up to feast, but the Allonautilus was the star of the show, exciting the scientists when they spotted it. It even stayed for two hours snacking while being whacked repeatedly by the tail of a sunfish that was also in the area. It was one of several nautiluses found at a depth of 600 feet, where water tends to be cooler. Nautiluses like cold water and tend to stay deep until the evening when they come up to the surface to feed. To keep the nautiluses comfortable, the researchers brought them up in chilled water and took a few samples before releasing them back into the water. Nautiluses are considered to be a threatened species because they are mined for their interesting spiral chambered shells. As a result, some populations have been driven to extinction, and experts warn that if something isn’t done, this super-rare species could become extinct as well. An article from Ward’s University of Washington states that the U.S. Fish and Wildlife will be deciding this September whether the nautiluses should be classed as a protected species.